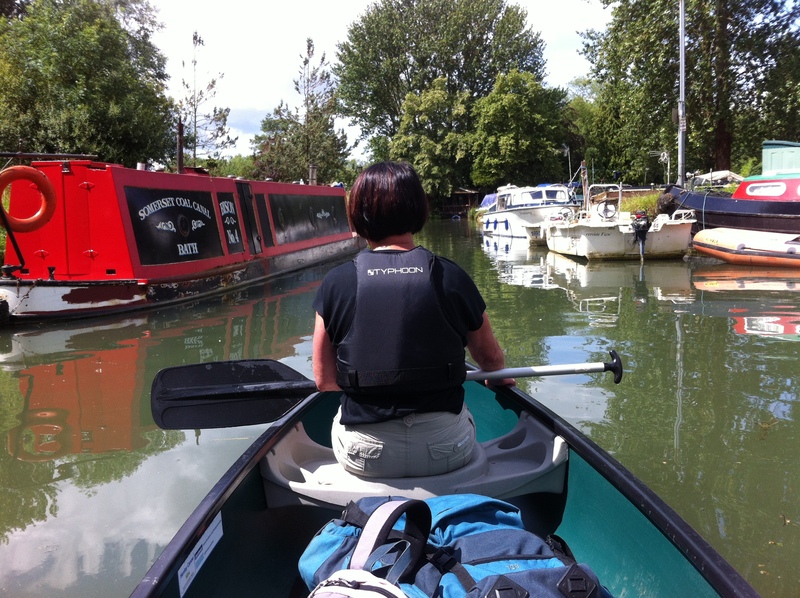 5 Days Canoeing the Thames? Well it seemed like a good idea at the time! And I still think it is, perhaps 3 days is enough though. We have little experience of canoeing, actually none but my wife and I have done a couple of days in Hawaii kayaking , We are in our 60s but we know how to apply ourselves so canoeing on the Thames can’t be beyond us? Especially when accompanied by our 2 sons in their 20s and as fit as butchers dogs who regularly attend the gym. They have no experience at all of boating, other than an hour on the serpentine rowing. 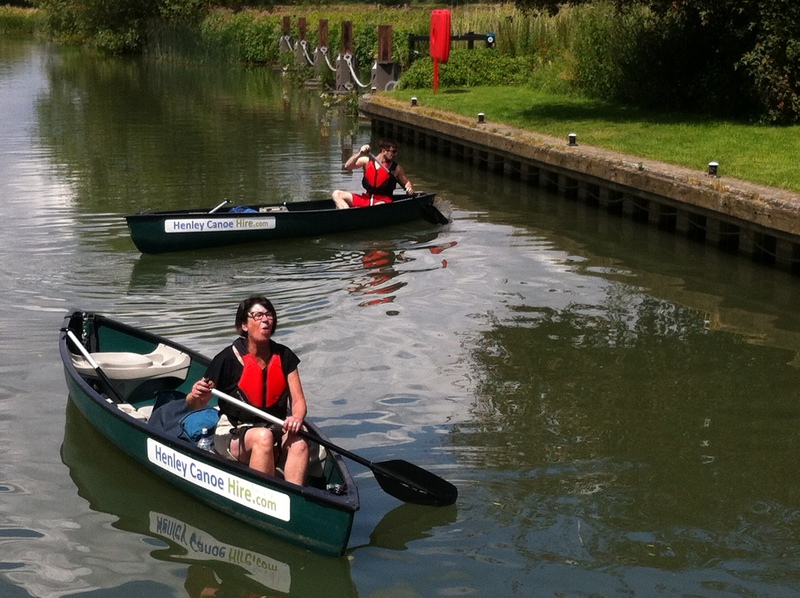 After looking on the Internet for ‘canoe hirers’ on the Thames we chose Henley canoe Hire 0118 402 5820. Mainly due to his calm positive response to our on line enquiry. I am so pleased we did he turned out a blessing . More later. It is not cheap, but what is these days? We find a walking holiday is £100 per day for 2 if you are lucky, add on to this canoe rent and you are into £150 All things considered. Even more when you add fuel ,parking charges and the odd pint. The biggest problem on the logistics front is to decide where to start, where to finish and then connect the overnights to coincide one after the other and close to the river. Book early is the only sure cure there, we were working 3 months ahead and still, it was a challenge. We planned to put one of our cars at the start and one at the finish so car parking needed arranging too. Otherwise you are relying on taxis, and public transport which can be a nightmare and very time consuming. We chose Rose Revived at Newbridge for our first overnight on the Monday as it happened. This makes the canoe rental a little less expensive than over a weekend, and the B&Bs are similarly less busy. So Where to start? With a free car park? A bit of a search and I concluded St Johns Lock at Lechlade was it. Plus, free parking was close by. It did mean a 16 mile paddle though! Still I thought it was within our reach. I did some homework and concluded that Canoeing is about as fast as walking, 2 mph is what we do on foot so 8 hours and we are there. 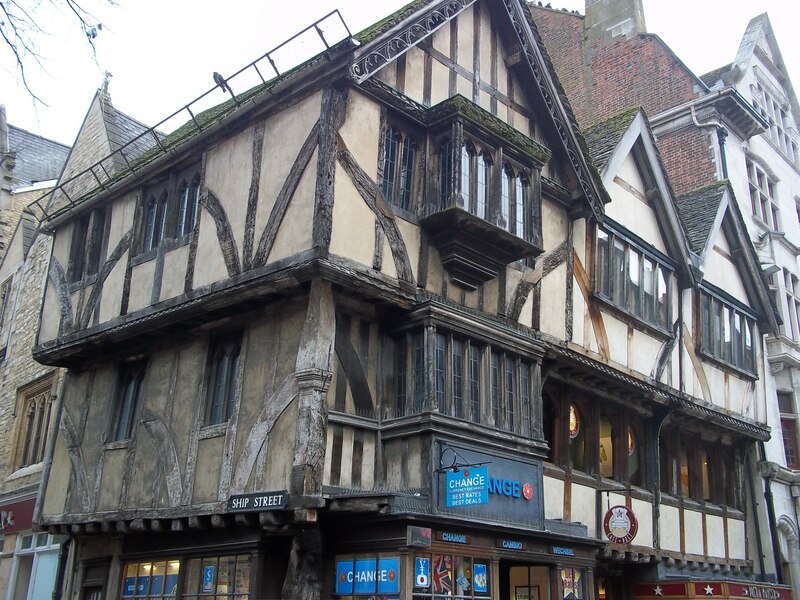 The following day Was to be 13 miles which put us in the centre of Oxford at a hotel called ‘The River’ followed by a short 10 miles to Abingdon which meant we could have a morning in Oxford a beautiful city with good walking tours, a tale to tell and supreme architecture. Then we would do a 12 miler followed by a 14 miler to finish in Pangbourne where they have a long stay car park (about £25). Guy from Henley canoe phoned several times to see how we were and arranged to meet us at St Johns lock at 10 am ( yeah , a good plan 8 hours, finish at 6 dinner and bed-perfect). We had a bit of an ‘ add on’ on the start day, we had a friend to drop off in Oxford en route to Pangbourne to park the end car. We allowed an extra 1/2 hour for this although Oxford ring road was part of our itinerary, it was at Rush hour so better safe than late. It was our first mistake, we should have allowed an hour! The journey was also 1/2 an hour longer than the sat nav predicted so we were an hour late meeting with Guy and the canoes. He was as it happened a calm and patient man. He also let me know that the free car park I had found, had, in the last couple of weeks turned into a pay and display! However he had found a place for us to park in the boat yard at Lechlade which would be our new starting point a further mile, meaning an extra lock to negotiate, upstream. Still with a hard days paddling he thought we could make it ok. He went through his safety lecture( compulsory by his insurance company) etiquette on the Thames and a bit of canoeing technique then we loaded our rucksacks and we were off! Sue and I led ( we were the most experienced of course) followed by the lads who crashed into every obstacle in the boat yard as we zinged and zagged our way to mainstream Thames. By now it was 11.30 ! Our schedule was looking tricky our competence and speed improved slowly so I was still relatively optimistic. The locks however do slow you down even when they are manned by a keeper as many were. It must be near 20 minutes lost at each one. On the upside it does give you time to rest. The day had started bright and cheerful but we could see nimbus rolling in as we approached the 4th lock where the very helpful operative and they are all very helpful and encouraging informed us we could take the only ” canoe pass” on the Thames. 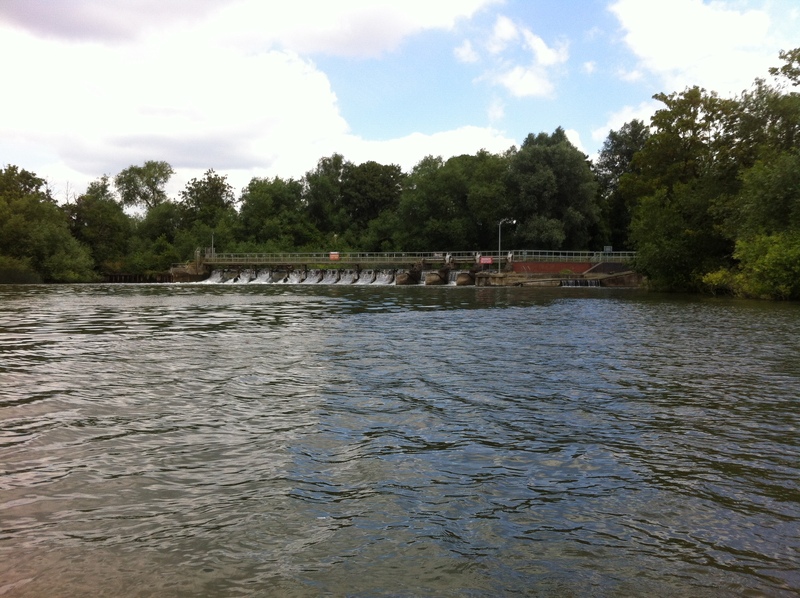 This saves using the lock and sends you down to the next level close to the weir but at a somewhat less risky pace. It wasn’t easy mind and my ‘front man’ Sue was in a negative frame of mind and failed to push us off the hazards so we got stuck several times. It was ‘sweaty’ fun though and I thoroughly recommend it. When we reassembled our selves after this stimulating interlude the heavens opened. An impressive cloud burst lasting for half an hour. We sheltered under some willow trees while we climbed into water proofs. Time was still ticking though, it was now around 3 pm. After another lock or two we arrived at, what in my dreams was our lunch stop, the Trout at Tadpole bridge. At 5 in the afternoon you can’t, in all honesty call it lunch. They don’t serve dinner until 7! We were cold and a bit damp so chose hot tea, coffee and crisps, whilst we pondered our dilemma. 9 miles covered and according to some fellow travellers in a motor cruiser on the same Trout mooring as us, still had 8 to go! My personal remedy for these situations is always to carry on but try harder! Other members of the team could see the futility of this and conspired to mutiny, refusing to get back in the boat. We were 8 miles short of our destination leaving 21 miles the following day to reach our second overnight if we rejoined at the “Trout” the following day. Not really possible. A plan was hatched, Sue simply refused to take further part in any paddling, ever ! Phew! That left us a canoe with one man, with more distance to cover than was possible. We could get a taxi to Rose revived eat and sleep. Then fully rested we would devise a cunning plan. The Rose Revived was delight, the staff so relaxed nothing was too much bother, I can thoroughly recommend it. The Taxi on the other hand was a bit painful,15 miles and £30 including the tip! Ouch! After the refuel ,sleep and a smashing breakfast, we decided Sue would, from the garden, telephone Guy at Henley canoe hire tell him our quandary. Cancel our last 2 overnights, with loss of deposits. Asking Guy if he could pick the canoes up from either the Rose where we would abandon the whole project, or from a bit further downstream if we could make it. 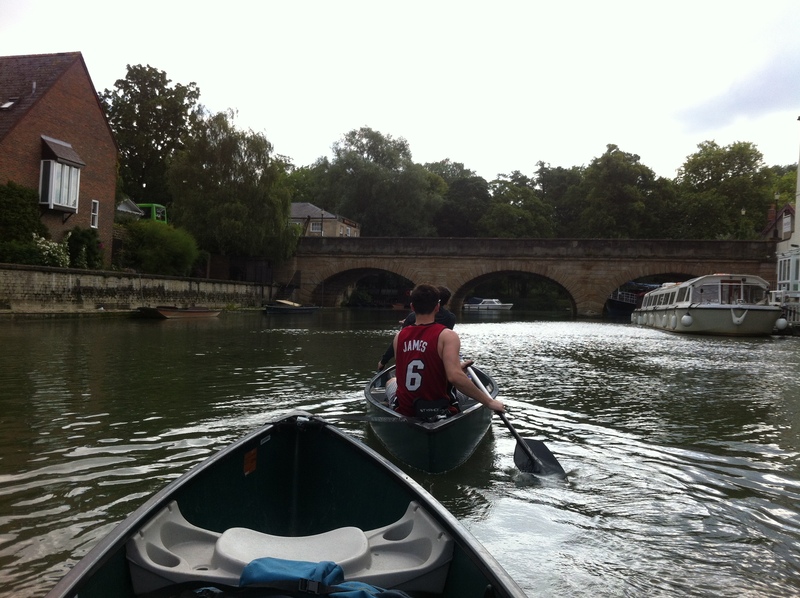 And/Or take us and the canoes to our hotel in Oxford where we would attempt another day and finish in Abingdon! Meanwhile me and the boys would taxi back to Tadpole bridge and paddle the canoes to meet Sue at the Rose, to examine the results of the phone calls. We thought we would make it by about 1 pm in time for a spot of lunch and the pow wow . The taxi this time was a bit more attractive at £20 including the tip, in a superbly trimmed people carrier. Driven by a very nice man. So if you are in the area the “Really Nice Cab Company” is the one. Telephone Paul on 07807 176886. We tied the 2 canoes together, 2 men in the front and one in the rear basically being towed but supplying forward momentum by paddling. This worked well we started to pickup speed. We planned to swap places at each lock, this too worked ok and we picked up more speed. The Cunning Plan in opperation. Just after 2 and a half hours paddling we were approaching a rather attractive old bridge with equally attractive buildings on each side when I received a phone call from Guy! He was sorry to hear of our plight and was keen to assist wherever he could. What a bloke! A real professional with customer care and happiness as his priority. 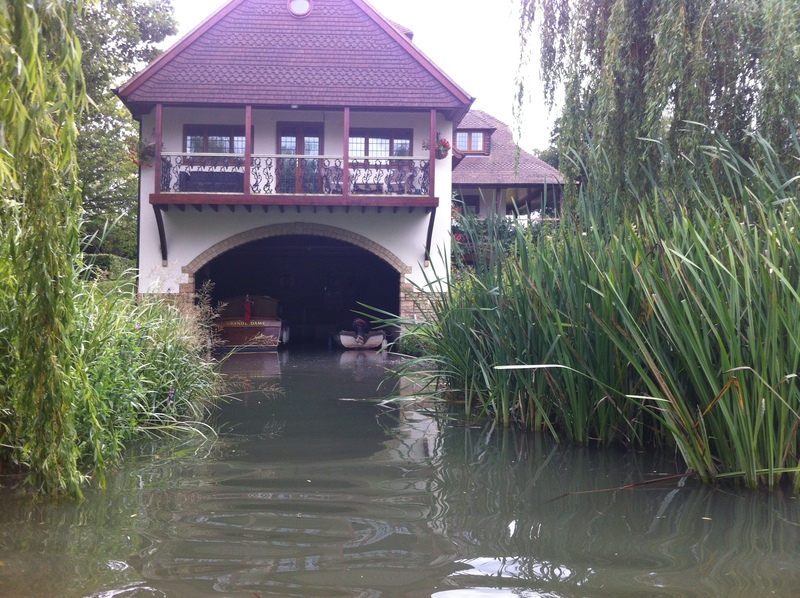 I am proud to recommend Henley Canoe Hire to anyone. He asked us our whereabouts I told him about the bridge and just to hang on a moment and I would be able to pinpoint the pub I could see looming up. Lo and behold! We had arrived at the Mulberry Bush tavern and the Rose Revived was on the opposite bank! What is more we could see Sue sat at a table in the garden! My odometer was reading only 6 miles but we had done it so quickly. Over 2 miles an hour, marvellous! A tip Guy had offered as we had a passenger that refused to paddle, was to tie the canoes together at the front. Making a delta shaped raft in effect, with one paddling at the front and one each side at the back. Sue could then sit in the centre seat of one of the boats and knit,read,take photos or whatever. This idea was rejected, she refused to even get in! Preferring instead to spend another £20 on a taxi to the Ferryman which I estimated was about 2 miles downstream. Oh well what can you do? Me and the lads set off using our towing system As it had proven effective and relatively swift. The Ferryman turned out to be nearer 4 miles, though we made it in around 1,1/2 hours. ( only 1 lock) Sue was sat in the pub garden which happened to be closed for the afternoon, with our rucksacks that she had taken in the taxi. Guy was waiting on the opposite bank ( nearest to Oxford ) We unhitched our boats and I ferried Sue and the bags across the river, so in the end she was forced to ride, if only for 50 yards. Arriving at the River Hotel on Osney Bridge, the canoes were unloaded and chained to a tree in the garden. I had arranged this with the management when I booked the place. I would be hard to find an overnight closer to the river than this one. The garden fence stopped you falling in! We could not launch from there mind we had to carry the canoes about 50 yards to an easy launch site. 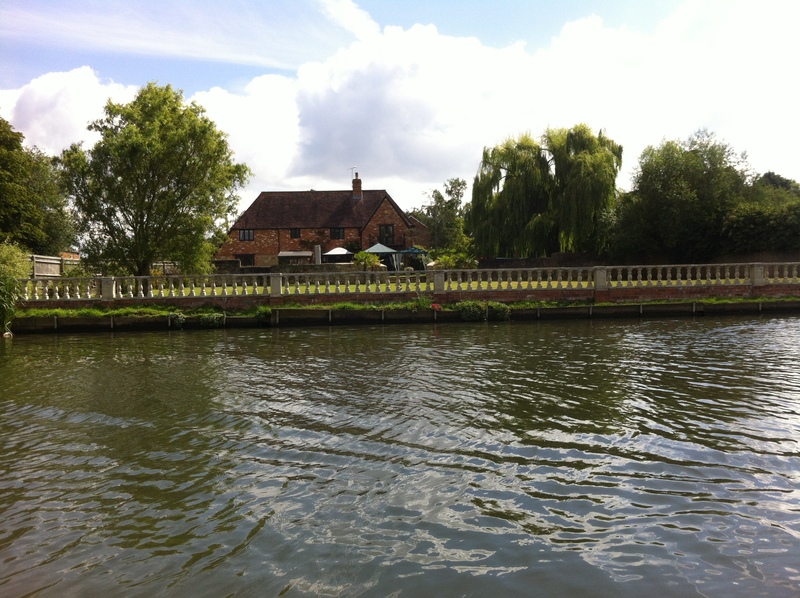 The River is a bit more commercial than tourist but still £90 per night B&B. The breakfast is a good one though. I guess the place needs a bit of freshening up but it was fine for us and again the staff were brilliant! We had an evening walk around Oxford in the surprise summer rain, so the place was packed and busy with inappropriately dressed students commuting hither and yon. 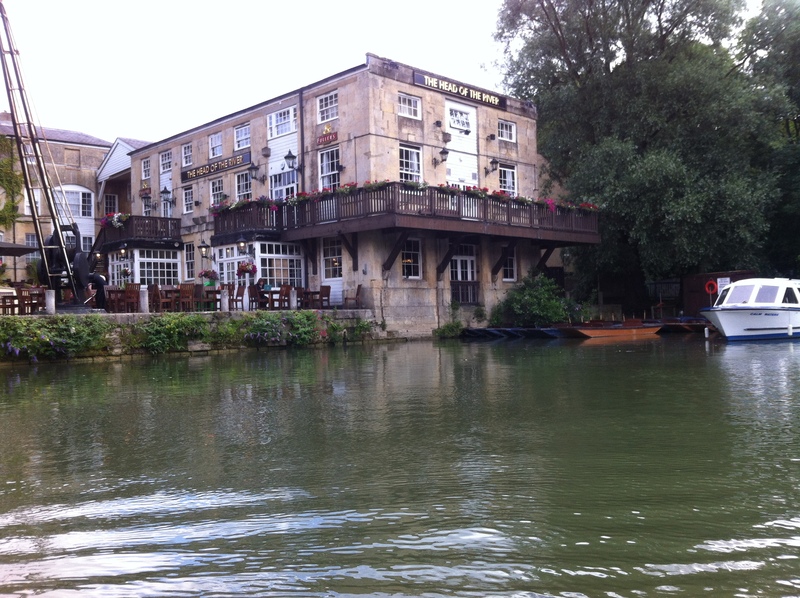 We ate at the “Head of the River” a riverside pub on the Thames or rather the “Isis”as it is called in Oxford . Sue and I had stayed here a year previously and liked it. 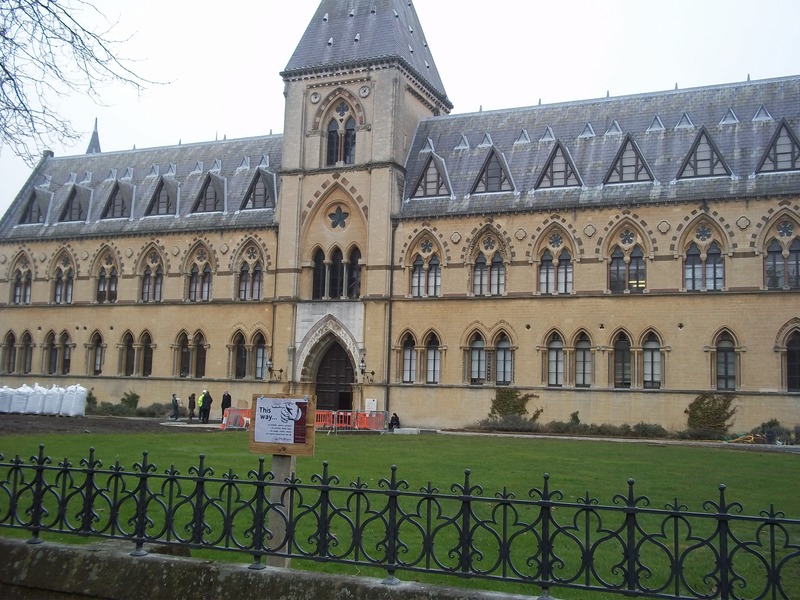 The rooms are all named after writers, Oscar Wilde, Charles Dickens et al rather than numbered. It was full this night BTW, consequently we were booked in the “River” . We also looked out travel arrangements for the chief mutineer, so she could pick up one of our cars and meet us in Abingdon. After Dinner we took a continually moist walk through Christ College gardens, in the fallorn hope that some architectural culture may be absorbed by the lads, exiting by Merton college and on to Magdelin Bridge road. 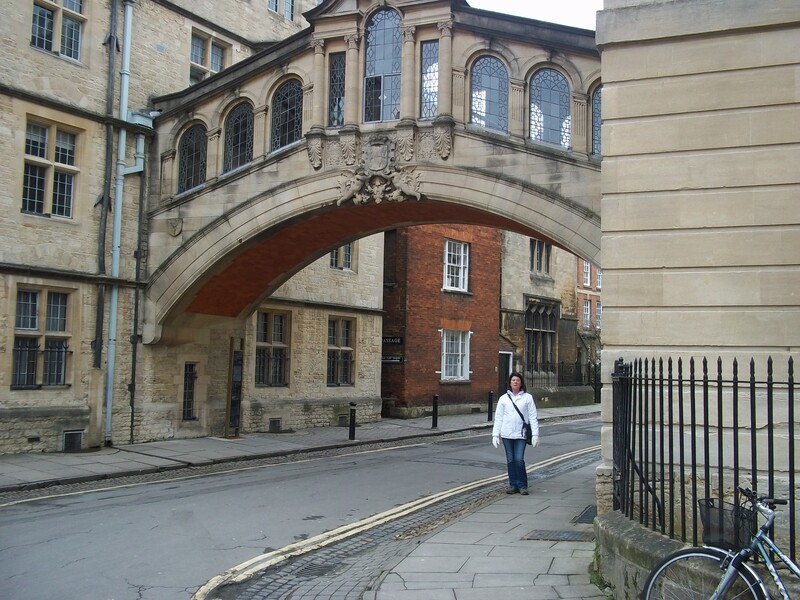 We then diverted past the Radcliffe Camera,the Bodlian Library, the Sheldonian Theatre then down Broard street and back to our hotel. Passing more beggars and street artists than you would think in a city as rich as this one. Or maybe that is the reason? The beggars go where there’s money! After breakfast the following morning Joe and I carried the canoes, or rather we “portaged” them, to our launch mooring. Whilst Adam fetched provisions from the supermarket. We moved off at 9,20. It was only a few hundred yards to the first of the days locks, this one is called Osney, the operators, again a friendly pair of blokes, had no Idea at the origins of the name when asked but we enjoyed a bit of abusive banter during the hydraulics. All operated by push button electric motors from here on to the capital! On we went and I was expecting the Isis to be a bit industrial and unpleasant through this part of Oxford but it turned out ok, maybe it was the sunshine I don’t know. It wasn’t long before we were passing under folly bridge and past the pub of last evening and several punts mored close by. The river starts to widen here and the Oxford university boat clubs have their boat sheds along here on the left side some fairly modern which contrast with a couple from the 30s or 40s all displaying the appropriate coat of arms. Suddenly on the right emerges another, well you can’t call this a shed by any stretch , it’s a palace, a very modern glass affair with a viewing balcony, displaying what you would think would be a need for those passes you see round the necks of the privileged these days. With perhaps a pint of Pimms served by a dicky-bow’d flunky. Is it perhaps the HQ of the chosen 8 blues? Or at least where the best of Oxford’s rowers are trained and whittled down to the 8? As we passed a rather scruffy looking ill-kempt little cabin cruiser mored on this section, I made a sarcastic comment about the way in which duct tape had been applied to one of its windows in a rather careless or perhaps arty way if you were of a generous disposition. Never expecting anyone would actually be at home on this wreck, that is until a head emerged complete with frown! We picked up more speed. 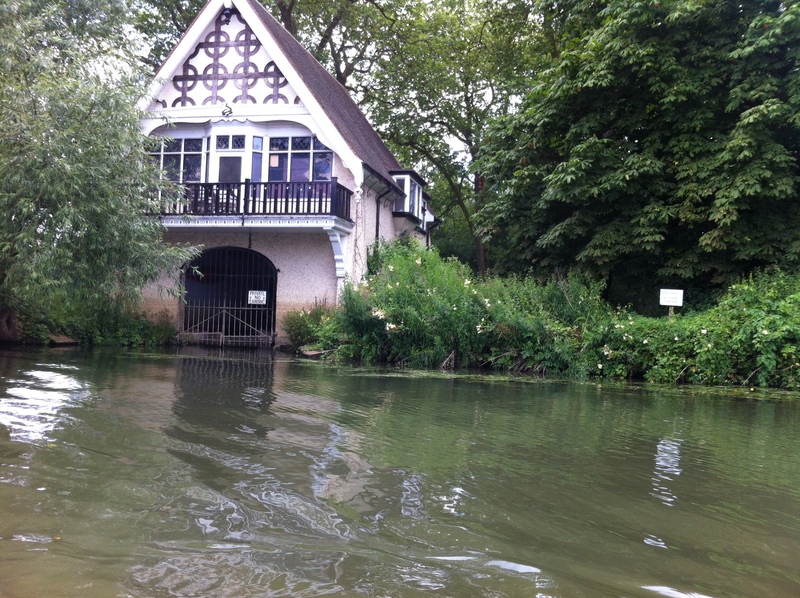 There are one or two rather natty houses that run up to the Thames along here. Probably the reason the Thames path has to swop banks so many times. Well who would want a scruffy walker strolling by at the bottom of ones garden? Some of the gaffs are quite something, one or two have a moring and some a drive in boat house! A Drive in Boat House? A Double Drive In Boat House? We reached our 3rd lock of the day, ” Sandford” a bit ahead of lunch, we were making such good time. We had an idea to stop and imbibe at the Kings Arms but they were not open yet, so onwards and onwards. Incident.y the weir here is called the Sandford Lasher! It’s a whopper and a bit on the scarey side so best avoided. About this time we came upon the only snooty pair we met on the whole journey. They were in a million dollar cabin cruiser mounted on white leather seats at the wheel about 30 feet above the river! Burbling along looking down their noses, they had little choice I suppose from that height. A little while later we had to get out of the way of a tourist cruiser absolutely full of pensioners there must have been a hundred of them taking the river air, god knows where they were going maybe just up and down stream? It was the largest craft we had come across in 3 days. Abingdon lay not far ahead and it was still only midday! Maybe we were calling it a day far too soon? Such was the improvement of our competence. We elected not to change our mind again though. Especially as Joe had said he had enjoyed the enterprise, was pleased he had experienced it but perhaps didn’t need 3 days of it! We negotiated Abingdon lock alongside a couple from Ilkeston a town near our own, who were in their narrow boat and had set off 2 weeks ago. I was mildly surprised they had come so far in that time having to zig zag the way from the Erewash to the Thames. Had he said 2 months I would not have been so, anyway well done! pointing left! So I changed my mind for the final time. NO LEFT ! I was so pleased the boat yard appeared immediately after the bridge on the right bank. Phew had we taken the right channel it would have bought us a nightmare and a rather sweaty bit of work. It looks nothing like it using Google earth! Anyway we had reached our destination. We were wondering if Sue had made it too? Little did we know she was on the opposite bank watching us land! We gathered together after parking the boats and retired to the restaurant on the island we had been dithering about. The Nags Head. It was lovely a great way to finish something that had turned out so rocky at first. 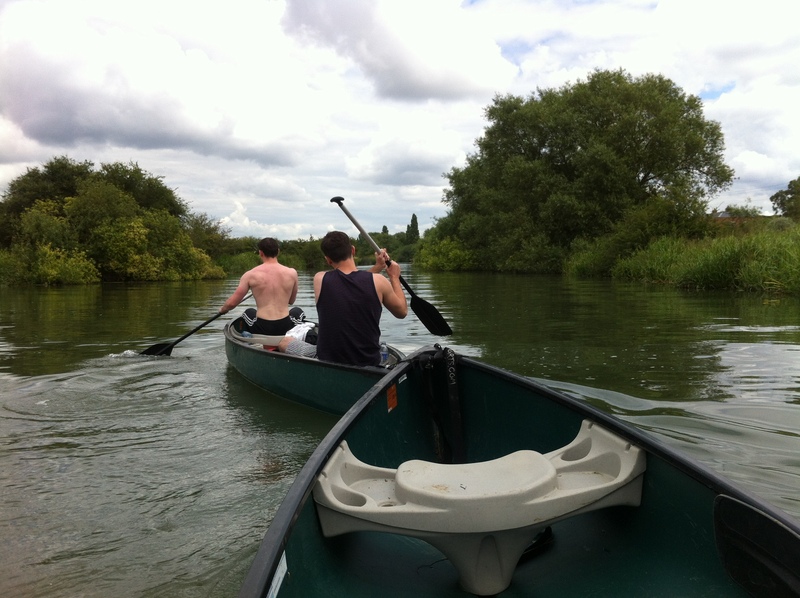 Thanks go to Guy at Henley canoes, my crew, Joe and Adam Horton, we laughed nearly all the way. Sue for pitching in and doing the best she could.